On this Memorial Day weekend, and in honor of all who have served or are currently serving our country, I thought it appropriate to share this piece on how Meditation can be helpful to those who have put themselves in harm’s way for the sake of our freedom. Sprinkling “Omm” mantras between “Ooh Rah!” battle cries can pay dividends for members of the Marine Corps and other branches of the military. According to a growing body of research, regular meditation improves the well-being of military members — both active duty and those who have previously served. Meditation is rooted in spirituality, which affects personal wellness in its own way, but the neurological underpinnings of meditation’s other health benefits are being widely assessed by researchers, and they’re building a scientific case for its benefits. 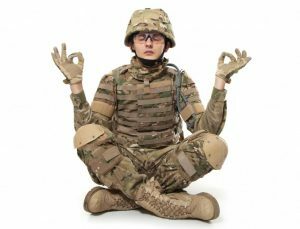 Commander Jeffrey Millegan, MD, who currently heads the Mind Body Medicine program (MBM) at the Naval Medical Center San Diego, studies meditation’s effect on military personnel. His publications, to name a few, include a case report on the ways regular meditation increased the quality of life of a Marine with chronic pain and a preliminary study on using it as a stress-management tool to help cancer patients. In October, researchers estimated that integrative programs like Millegan’s MBM could reduce healthcare costs by 43 percent. In a retrospective observational study, scientists from multiple institutes, including the Benson-Henry Institute, found that participants in the MBM program had 41 percent fewer clinical visits, 50 percent less imaging, 43 percent fewer laboratory visits, and 20 percent fewer procedures. ER visits were also reduced by more than half. In 2011 researchers at UC San Diego School of Medicine and Naval Health Research Center conducted a test to see if meditation helped soldiers recover from stress more efficiently. Participating Marine units had to complete operational challenges while exposed to close-quarters combat situations created by role players. Half of them received mindfulness training for 20 hours over an 8-week period, including classroom instructions, interviews, and workshops. The researchers periodically assessed their heart and breathing rate, blood samples, self-reports, and for a portion of them, fMRI (functional neuroimaging). Brain scans showed that meditation activated the insular cortex, which helps regulate stress, emotions and homeostasis. According to the paper, those who meditated demonstrated “a more potent response to stress followed by quicker recovery” compared to those who didn’t. In 2013, her team invited 42 veterans to participate in a 12-week loving kindness program and studied its effects through multiple questionnaires. They reported a significant decrease in depression and stress and an increase in self-compassion and mindfulness, when compared to baseline measurements. In a follow-up study, meditating veterans also reported higher levels of pleasant emotions and self-acceptance, indicating an increase in their quality of life. McManus says most of the time patients spend a lot of energy simply trying to accept their diagnosis or a present situation. How nice to see them using preventive health like meditation vs. medication. Enjoyed the article. Hey Dana. I’m always looking for articles supporting my belief in how helpful meditation can be. I too was thrilled to see the military being open to more holistic ways of healing. Thanks for stopping by.